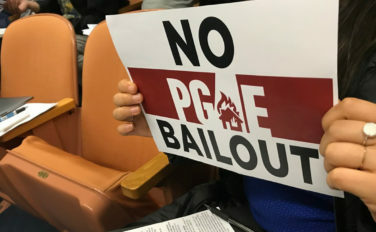 Protestors disrupted the California Public Utilities Commission meeting Thursday over plans to allow PG&E to pass on the cost of the wildfires to consumers. Wednesday night, a federal court judge proposed some tough new rules to prevent any more wildfires caused by PG&E. And today, the emotion spilled out at a public hearing. Protestors used public comment at Thursday’s PUC hearing to read the names of those who died in last year’s Camp Fire. Mark Toney of The Utility Reform Network says PG&E wants consumers to pay for the utility’s negligence. “Any wildfire that’s caused by negligence of PG&E should never be paid by customers, should always be paid by shareholders,” Toney told the I-Team. State Senator Jerry Hill’s district includes San Bruno, where the 2010 P-G-and-E natural gas pipeline explosion destroyed a neighborhood and killed eight people. A jury found P-G-and-E guilty of six felonies — safety violations and obstructing the investigation. In his proposed order, Judge Alsup accuses the utility of violating its probation in that case, by not informing the court of the investigations it faced for the 2017 North Bay firestorms. Judge Alsup is very clear. His aim is to reduce wildfires caused by PG-and-E to zero. He has set a hearing on this proposed order for later this month.